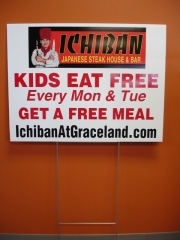 Need a quick inexpensive way to get the word out? 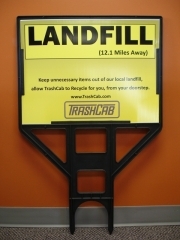 Whether you need some basic text or a full color print, we will make it easy to get what you need. 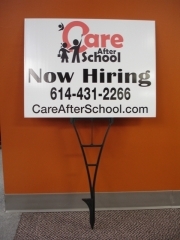 Our yard signs are 24″ x 18″, produced on 4mm coroplast, and they come with the wire stakes for posting. 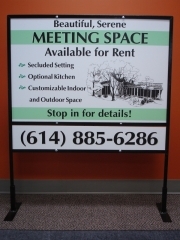 Or for a more study sign display, consider the signicade A frame. 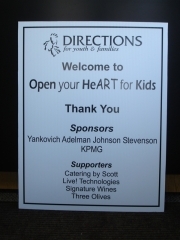 Next Day Signs did a fabulous job on a sign I needed for a fundraiser. They printed a photo on the front and had wording n the back. I worked with Amanda at their location near the post office on Nicholas Road off of 161. She was kind, knowledgeable, friendly and professional. I would highly recommend Next Day Signs. 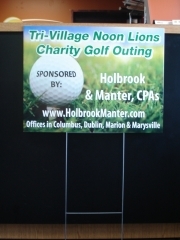 Next Day Signs went the extra mile to create a custom order for our annual golf outing. This outing is our main fund raising event for the year and the vendors/sponsors who attended were more than satisfied with the exposure that the signs provided for their companies. Sheryl and her team were very receptive to our needs and responsive to our inquiries as we moved toward our event. I would definitely recommend them for your advertising needs.